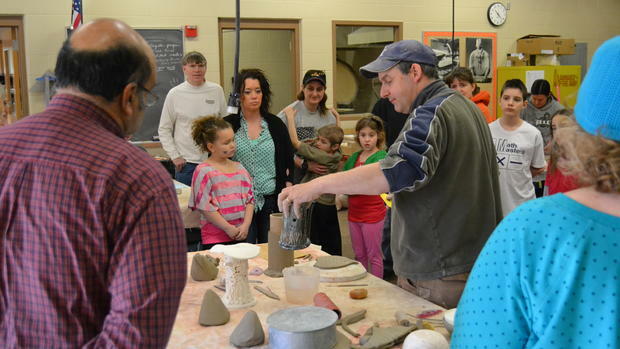 An alumnus of the University of Maine at Presque Isle has given back to his community in a big way thanks to his rendition of Empty Bowls, a unique fundraiser that brings together art and hunger awareness. Mark Lusardi—a former UMPI Fine Art student and current resident of New Richmond, Wisconsin—has helped to carry out New Richmond’s Empty Bowls event for the past decade, and has served as host to the event’s Community Building Day since 2011, all with the goal of helping to combat hunger in the region. His efforts have ranged from getting donations of clay to donating time and finances to make and design glazes for the event. 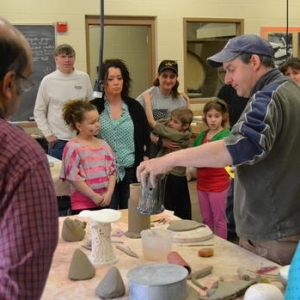 Six years ago, Lusardi added a Community Building Day geared for families to make bowls and items like bird baths, fairy houses, and luminaries to add more diversity to the event. He also encouraged local artists from the region to make donations or create their own events. The Empty Bowls fundraiser hosts area business sponsors to come in for their own private building night with their employees or volunteers. “As an UMPI alum and native of Caribou, Maine and Aroostook County, hunger and food assistance was a dire need for many of my friends growing up. As an adult living in Western Wisconsin, the need for helping families find the assistance they need is just as important,” Lusardi said. Lusardi noted that, as an alumnus, he was taught to make a difference in his community. Since the inception of New Richmond’s Empty Bowls, he has helped raise nearly $1,000,000 in funding and food to help fight hunger, including $19,000 during this year’s event. “The most amazing thing about volunteering in a community is helping people and volunteers understand that they can make a difference. Each year my wife and I get to meet new people in the community through Empty Bowls and this year was no exception,” Lusardi said. During these special events, participants reserve the pieces they make. The reserved pieces generate $3,000 to $4,000. Lusardi and event organizers also reserve some larger pieces or sets for silent auction. For next year’s Empty Bowls, they are planning to hold a black tie night and auction and offer a wine and dine portion to raise more money and interest. “To me the sponsor nights are the most fun and intriguing because they allow us to network with one another to make the event more successful. The silent auction brings in $10,000 to $15,000 and the sponsors fill the rest,” Lusardi said. Throughout the event, Lusardi donates the glazes and gets half of the clay donated through his work. He typically spends over 1,000 hours organizing, making, firing, and teaching others how much fun pottery is. Lusardi, originally from Caribou, now lives in New Richmond, Wisconsin with his wife and two children and has a fully functioning studio at his residence. Along with his work as a professional artist, he is a chemist and glaze technician for Continental Clay Company and conducts a series of workshops at colleges and art centers throughout the upper Midwest.